Yet I know that my blog might lead one to think that perhaps I am not much of a Canadian. I complained about the snow and cold when I was in Quebec City. I have many more blog entries from the United States than any other country. The biggest exclusion, though, is so shocking that I’m surprised the secret police of Canada haven’t come and taken away my passport. I’ve written about a lot of sports in my blog. Baseball has had its due. I’ve written about seeing both American and Japanese games, and even wrote an entry from Canada about watching the MLB All-Star Game on TV. I covered my experience watching a soccer game in Toronto with the inclusion of the Toronto FC in the North American professional soccer league MLS. I talked about seeing a Sumo tournament in Japan. I discussed rugby and basketball, and even had one entry that covered the a mash-up of sports, including the cycling of Tour de France, the off-road craziness of the Dakar Rally and Formula One auto racing. The sport that has probably gotten the most attention is American football, mostly the NFL. 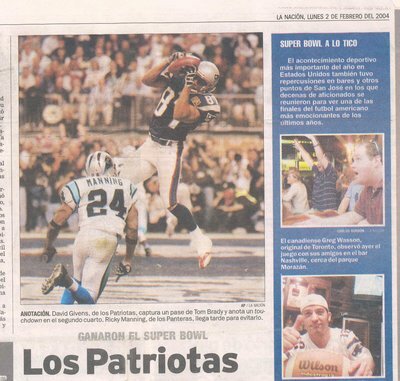 This over exposed blog coverage is due mostly to a realization I came to while watching Superbowl 38 in Costa Rica that, along with that Superbowl, I had watched the past 4 Superbowls in 4 different countries. That, I figured, was worth a blog entry, plus the creation of “past” entries to places that I had watched the big game (Denver, Toronto and Puerto Montt, Chile) Thus it was that my “Superbowls Around the World” series of blog entries was created, which continued the next year with an entry from Stone Town, Zanzibar, Tanzania, which if it wasn’t exactly about watching the Superbowl, at least it was about trying to watch the Superbowl. I watched this game in Toronto, at a friend of a friend’s place. Watching the game in Canada, along with the past two entries in the series both from the USA (New York and Seattle to be exact), pretty much smashes any illusion that this is a series of blog entries worth continuing, so with this we see the end of the series. All these entries on sports, and yet I have only made passing references (mostly in entries on Texas and California, of all places) to the most Canadian of sports – ICE HOCKEY. 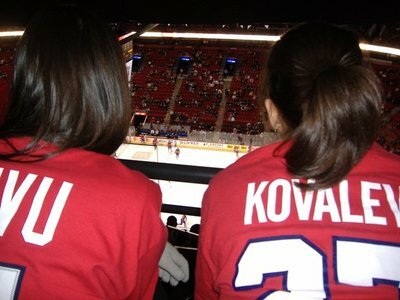 The strange thing is, that of all the sporting events I’ve ever witnessed, hockey is probably the one I’ve seen the most. I’ve only ever seen one NFL football game in person, and in almost every city I have seen a live baseball game in I’ve seen at least one NHL hockey game. 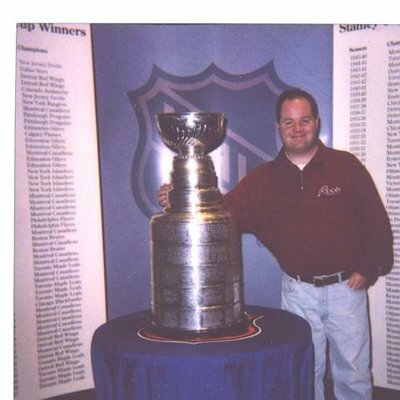 I’ve attended NHL games in St. Louis, San Jose, Atlanta, Buffalo, Ottawa, Montreal, and numerous games at home in Toronto. I even got to touch the Stanley Cup while it was on display in Denver, Colorado. Perhaps it is because I, like most every other Canadian, grew up watching hockey and have seen so many games live that I haven’t written about it until now. 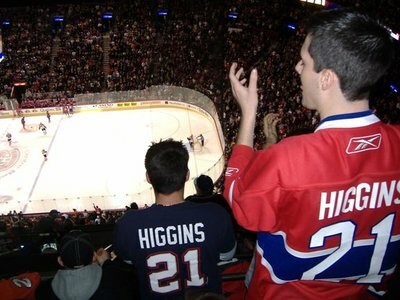 While probably a good proportion of the world’s population has never seen an ice hockey game live (or perhaps even seen an ice rink), it doesn’t feel like a very unique experience. 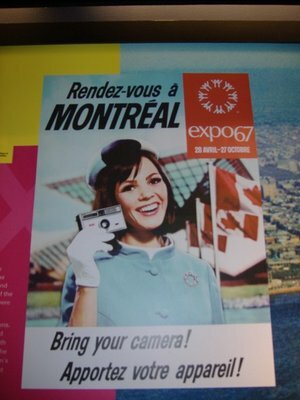 But no more, I figure it is time to Courier-Du-Bois-up and write about attending a hockey game, and what better place to write about it than in Montreal, Quebec, Canada. 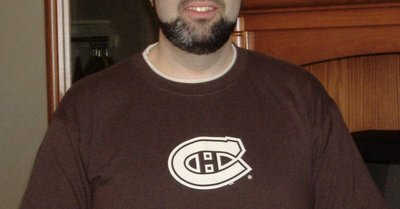 While many in Toronto might think of their Toronto Maples Leafs as the most venerable of hockey teams, the Canadiens are the oldest club in the NHL (debuting in 1909, eight years before the NHL itself was formed) and was the most recent Canadian team to win a Stanley Cup (winning in 1993). Toronto’s NHL team, on the other hand, haven’t won since 1967, which was before even I was born, which means it was REALLY LONG AGO. 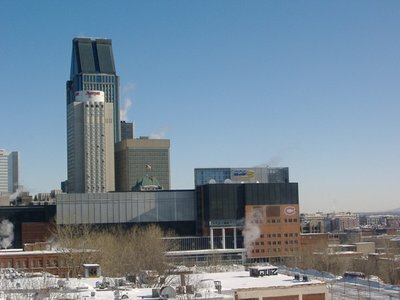 Plus, the Canadiens are owned by the guy who is a bitter battle to try to buy Liverpool FC, whereas the Toronto Maple Leafs are owned by a bunch of teachers. Which is cooler, a team owned by a dude who gets into bitter take-over battles using junk bonds, or a team owned by people who teach grade six math and social studies? 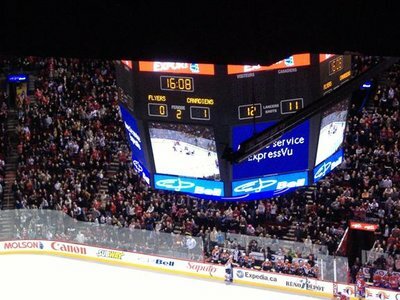 So, for your reading pleasure, a discussion of Canada’s game – Hockey in three periods. Ice Hockey is a game played by two teams on an ice surface called a hockey rink. The players wear skates that allow them to glide across the ice surface. There are 6 players on each team, 3 forwards, 2 defensemen and 1 goalie. At each end of the rink there is a net, which the goalie protects. The players all have hockey sticks, which they use to move a small black disk called a puck around the ice surface, in an attempt to score by putting the puck in the other team’s net. Players are allowed to bank the puck off the side of the ice rink (called the boards) and play can happen behind the nets. Players are allowed to hit each other with their bodies, called “checking,” though hitting another player with your hockey stick is not allowed. The game is played in three periods, each period lasting 20 minutes with a break between each period. At the end of the 60 minutes, the team with the highest score is the winner. A coworker of mine from India tells a story about seeing his first hockey game in North America. He was confused when all the fans left at the end of the 3rd period, assuming that the game was played in four quarters. After 20 minutes of sitting around in an empty hockey rink, he figured out that the game was over, and left. Where and when the game of ice hockey was invented is hard to determine. Similar games played with curved sticks date back thousands of years, though these games were played on fields. The game of hurling from Ireland and shinty from Scotland were no doubt brought by immigrants to Canada, and it was probably inevitable that in the winter these games would move to the ample frozen ice surfaces. In addition, similar games were played in northern European nations like the Netherlands in the 16th, 17th and 18th centuries, though without the skates. While the Society for International Hockey Research couldn’t determine the explicit origins of the game, they did identify the first recorded, indoor and organized ice hockey match, which took place on March 3, 1875 at the Victoria Ice Rink in Montreal, Canada. 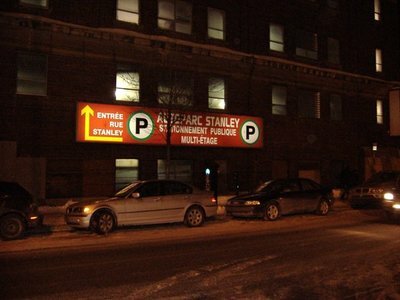 The Victoria Ice Rink no longer exists, torn down and replaced with a parking garage. 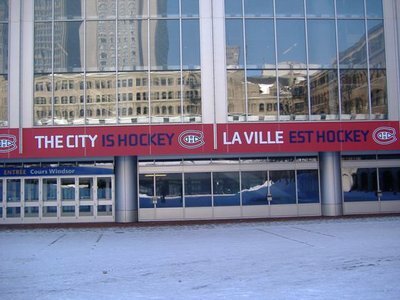 Some 132 ¾ years later, the Habs (a nickname for the team based on shortening another nickname for the team, The Habitants) play not far away from the site of that first game, at The/Le Centre Bell Centre (It’s Quebec, so you have to be bilingual, you know). My friend Brad, who is a huge Montreal Canadiens fan and myself headed up to Montreal, and after getting some tickets from an independent ticket agent (aka scalper), headed into the Bell Centre to watch the game between the Montreal Canadiens and the Philadelphia Flyers. Both teams play in the NHL’s Eastern Conference, and the Montreal Canadiens were one place above Philadelphia in the standings, so the game promised to be an important one for the playoff race. 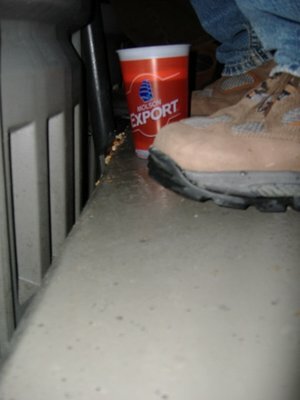 We took our seats, and purchased a couple of draft beers ($9.41 for a tiny glass of beer. Yikes!). The national anthems of the USA and Canada were played, and then the players took the ice. The puck was dropped by the referee, and the game was on. The first period was a tight fought match, with both teams putting ten shots on net but neither scoring any goals. Victoria Skating Rink, which held that first recorded indoor hockey game, was also the site of the first Stanley Cup Playoffs in 1894. Lord Frederick Stanley was appointed as the Governor General of Canada in 1888 by Queen Victoria. During his time in Canada, he became involved in the game of ice hockey, and in 1892 wrote a letter to the Ottawa Hockey Club, suggesting that “it would be a good thing if there were a challenge cup which should be held from year to year by the champion hockey team in the Dominion” (the Dominion, being Canada). Lord Stanley purchased a decorative bowl, forged in Sheffield, England, and had the words "Dominion Hockey Challenge Cup" engraved on one side of the outside rim, and "From Stanley of Preston" on the other side. Lord Stanley never saw any teams compete for his cup. He returned to England in July of 1893 to become the Earl of Derby, but his challenge cup idea had taken hold, and in 1894, the Montreal Hockey Club beat both the Montreal Victorias and the Ottawa Hockey Club to be the first Stanley Cup Champions. From 1895 through to 1914 the Stanley Cup was played as a challenge cup, allowing any team to challenge the current holders of the Cup. In 1915, however, the National Hockey Association (renamed the National Hockey League in 1917) and Pacific Coast Hockey Association came to an agreement that the respective champions in each league would play each other for the Stanley Cup. This continued until 1922, when the World Hockey League joined the fray. The three league format was short lived, however, with the NHL and PCHA merging in 1924 and the WHL folding in 1925. The Victoria Cougars won the Stanley Cup in the 1924-1925 season, and became the last non-NHL team to win the Stanley Cup, beating the Montreal Canadiens three games to one. Back in the present, the second period started, and at three minutes and 52 seconds into the second period, Montreal’s Andrei Kostitsyn put a shot on Philadelphia goalie Antero Nittymaki. Nittymaki kept the puck out of the net, but he fell to the ice. Kostitsyn took a backhand swipe at the loose puck and the went through Nittymaki’s skates and into the net. 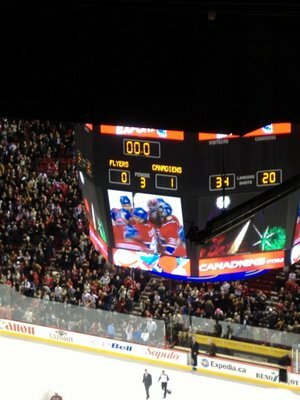 The second period ended without any more scoring, and the Montreal Canadiens took a 1 to 0 lead into the third period. 1925 found the Stanley Cup being competed for between the NHL champion Montreal Maroons and the WHL Victoria Cougars competing in what would be the last NHL-WHL showdown. The Maroons won the Cup, and later that year the WHL folded. From that moment on, only NHL teams have competed for the cup. In 1947, the NHL signed an agreement with the trustees of the cup to have exclusive control of the Cup, and reject any challenges from other leagues to play for the Cup. Originally made up mostly of Canadian players with a smattering of USA players, the NHL became the premier hockey league in the world, soon opening up its doors (and wallets) to international players. Today, the NHL has players from over 20 countries in its 30 team league. The Montreal Canadiens captain, Saku Koivu was born in Finland, and has teammates from Belarus, Russia, Czech Republic, France, Switzerland and the USA in addition to Canada. 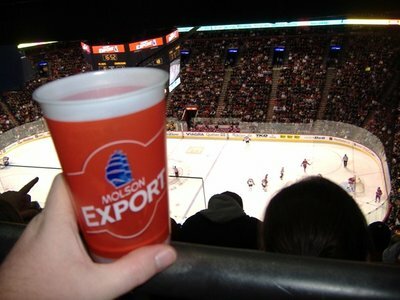 The third period started with a full beer, the last one of the night as beer sales are stopped at the start of the third period so that fans are not too drunk by the end of the game. 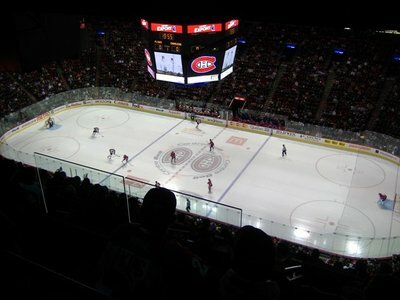 The third period was dominated by the Philadelphia Flyers, who put 15 shots on net, including a flurry during a short period when two of the Montreal players were sent off the ice for penalties, however the Montreal Goalie Carey Price stopped all the shots, and eventually the time wore down and the Montreal Canadiens won the game. Brad and I left, Brad very happy that his team had won, I just happy to have seen a good game. We wandered out into the cold winter night with the rest of the crowds. Bundled up in our warmest clothes and warm with the glow of a few beers after watching a hockey, I couldn’t have felt more Canadian. I guess I need to write about Lacrosse next. The game, invented by native North Americans and adopted by European colonizers, the game is the official sport of Canada and Toronto has a professional lacrosse team. Yes, that should be next. As Bono once said, "the world needs more Canada." Hi Greg! Aren't you glad we had our pictures taken with the cup? Who knew it would come in so handy. So true, so true. Well worth the wait in the lineup.